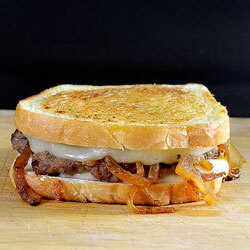 My Mom has always been a big fan of patty melts and she is responsible for introducing me to these yummy delights. She has waited tables part-time for years and she has probably served about 37,000 of them. I was young when she introduced them to me and whenever I get hungry for one I think about being a kid at the local diner and Mom suggesting it for lunch to me for the first time. 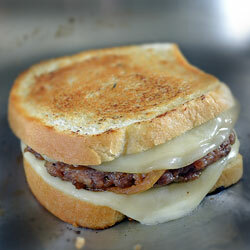 I think of patty melts as grilled cheese sandwiches with a meat patty tucked inside. • Never eat one at a fancy place, they have to be served at a typical mom and pop diner and should require lots of napkins. • When the sandwich is touched, there should be an ultra-thin layer of grease left on the finger tips that will leave an annoying grease-fingerprint on any object touched. • Grilled onions aren’t required but one without is like a salad without dressing. • Finally, there must be lots of cheese, more than a typical cheeseburger. Almost a burger with double cheese – not a double cheeseburger – a double cheese single burger! 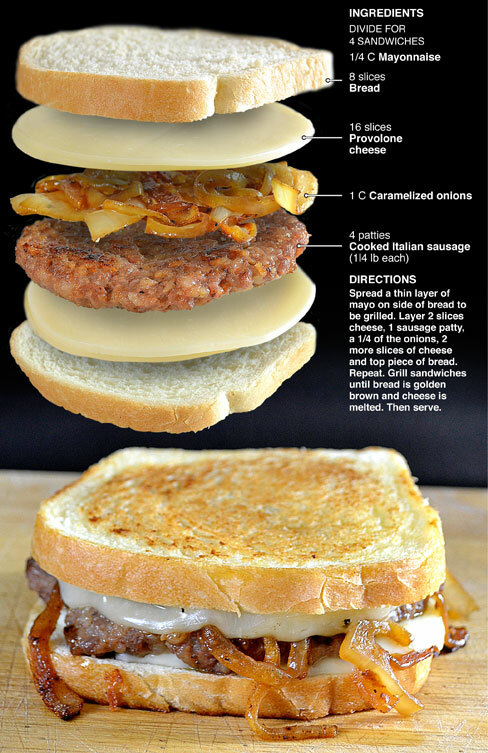 Instead of beef for this patty melt I used Italian sausage. Combined with the onions and provolone it was spectacular. I ate two of them myself. Had I not been feeding others, I might have destroyed another half sandwich, thank God more people were eating. This is the first time I have designed a recipe with a black background and white text. Usually there is too much writing in a typical recipe to do this. There is only so much type a person can read in that style without it starting to mess with their eyes. This, and the next recipe, are an exception and something new. I love the look and will try to incorporate it more. I think it will work best with sandwiches and pizza, or recipes that don’t include as much written instructions. It’s always good to experiment when it comes to design and presentation, it might be the start of a new trend, or I may say to myself in a couple of weeks “What the hell was I thinking!” For now, I think it’s cool. Spread a thin layer of mayo on sides of bread to be grilled. 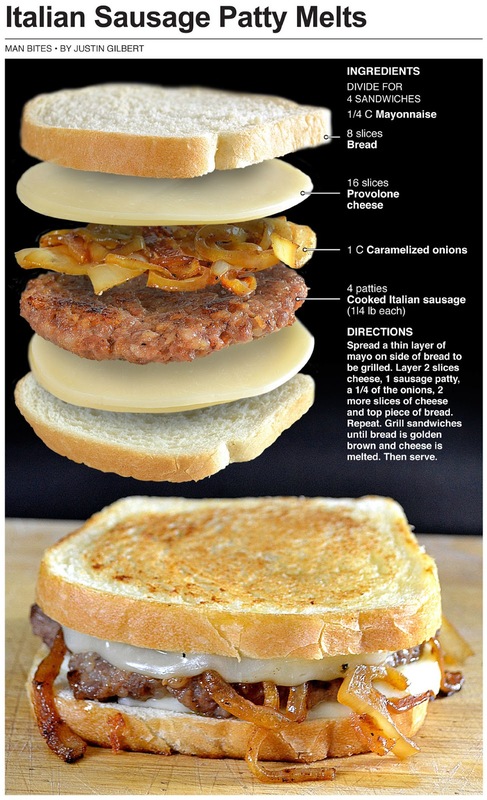 Layer 2 slices cheese, 1 sausage patty, a 1/4 of the onions, 2 more slices of cheese and top piece of bread. 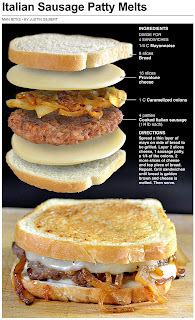 Grill sandwiches over medium heat until it's golden brown on each side and cheese is melted, 3 to 4 minutes per side. Then serve. When the sandwich is touched.... so true!